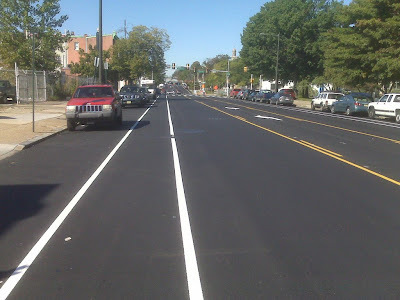 Back in the late 90's Philadelphia was putting in 30 to 50 miles of bike lanes a year, now with just over 200 miles in the city the majority of bike lane painting occurs with repaving roads that already have bike lanes. So it was nice to see that a stretch of Market St in West Philadelphia is getting new bike lanes. Bike lanes have just been extended on Market westward from 44th to 46th St, bike lanes are expected to be included from 34th to 38th once the street is repaved there. This will create an ad hoc eastbound connection to the Chestnut St bike lane via 34th St.